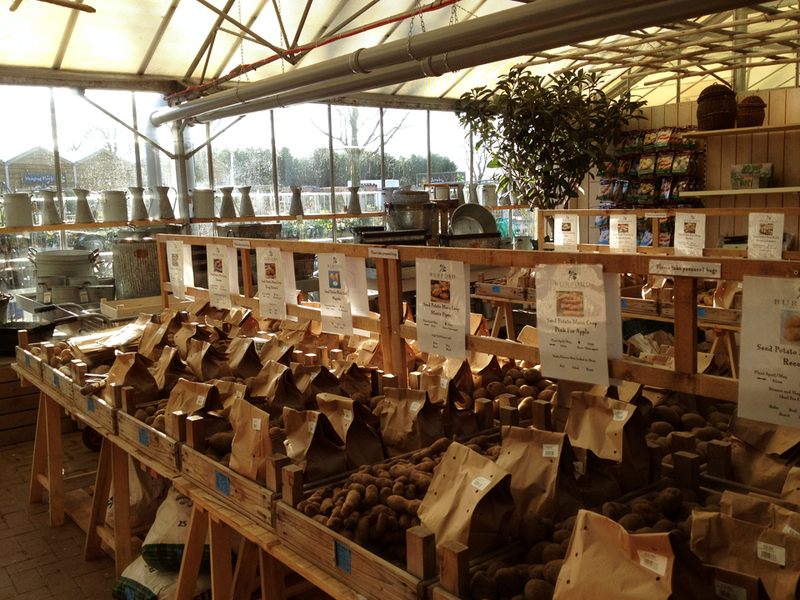 So, figuring that we can’t actually work all day, we decided to go have lunch at the Burford Garden Centre. You’d love it here. 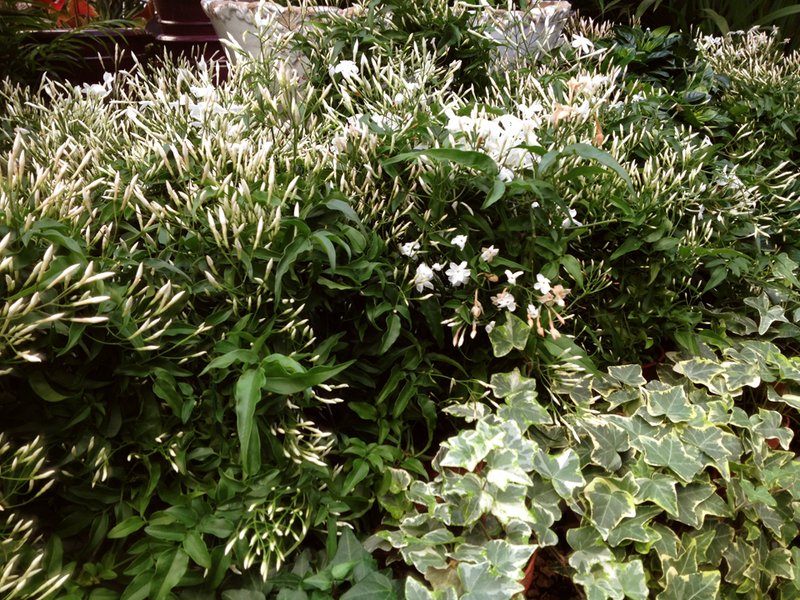 Walking into the huge, multi-layered, multi-spaced complex and hitting this wall of jasmine was just magical, and, as you come with me, imagine the scent paperwhites and hyacinths and orchids of every description following you around. 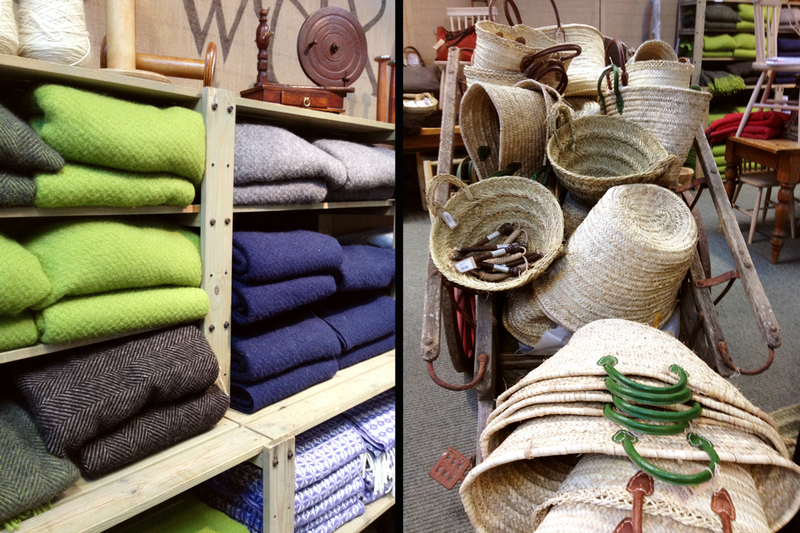 There is everything here you could imagine, and I fell in love with the hand-spun and naturally dyed wool products, like these blankets, and the hand woven market baskets. The lovely thing is that mostly all of the products are made in England by small British enterprises. 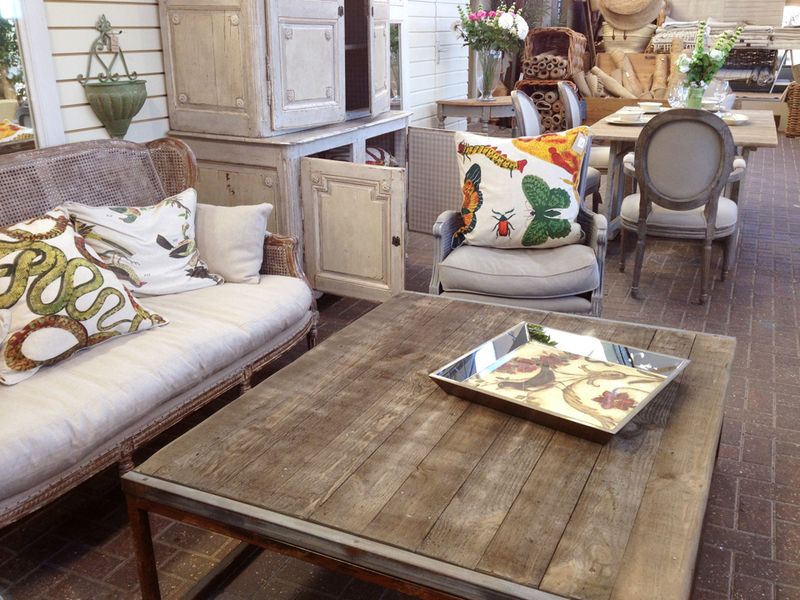 Robert and I planned on how we can construct a barn board table like this one. I thought about painting some fabric for pillows. 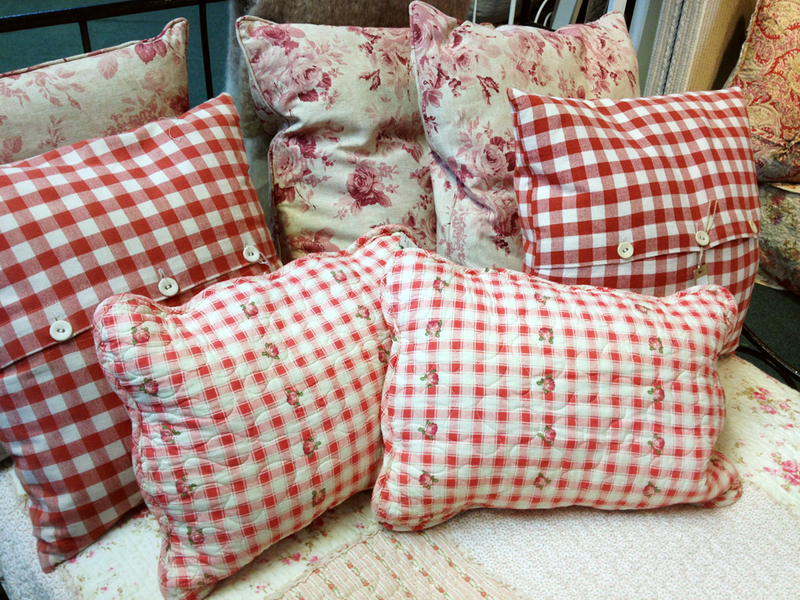 Or maybe just stitching up some gingham pillows for the spring. Aren’t they fresh and lovely? 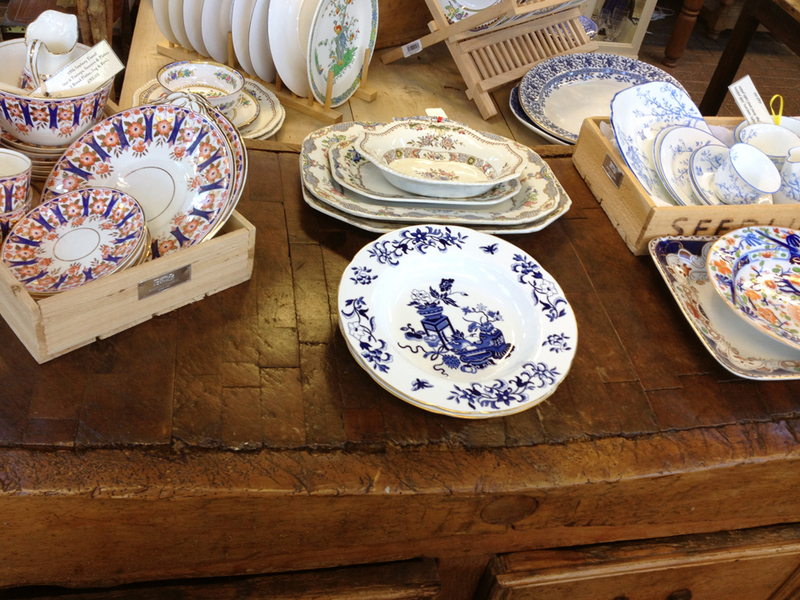 And they have the loveliest collections of old china. 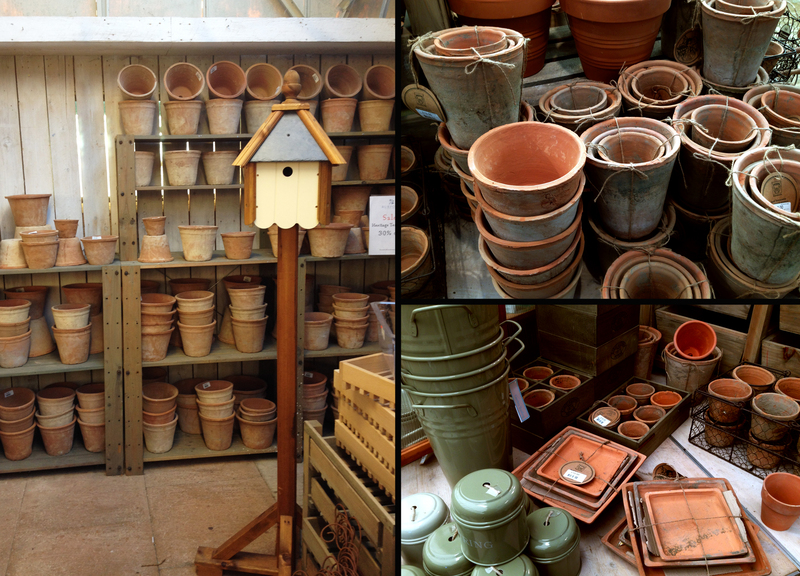 But of course, since this is a garden centre, there are garden supplies, and loads of beautiful rustic pots. Those are my favourite. And, apparently, it’s time to think about planting potatoes and onions. Not in this soggy ground, I’m afraid. 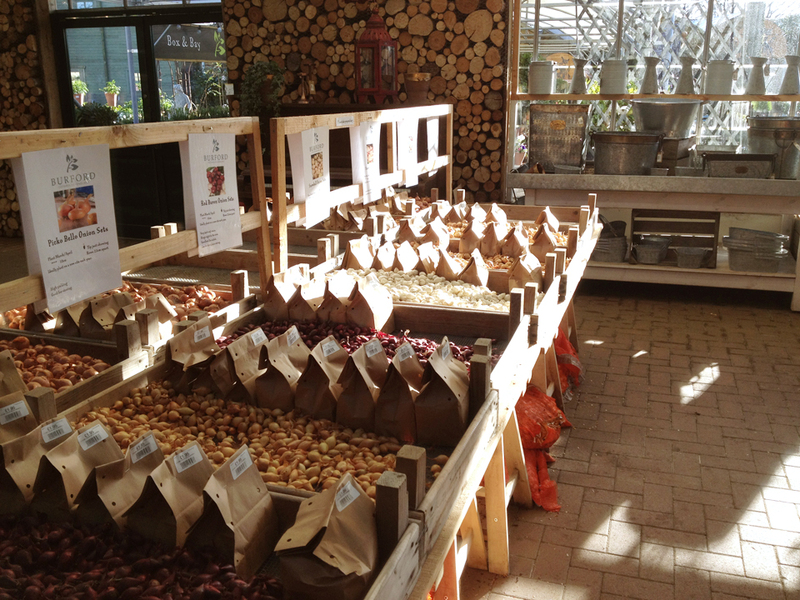 I bet it smelled lovely in the gardens and in the garden shop, all earthy and clean like laundry does in the sun. What a splendid table, like I have room for another table anywhere in or out of my house; but I like it A LOT. Only in England. Is there anything at all to compare over here? I don’t think so, at least not on the island. It sounds like a lovely way to spend an hour or two. 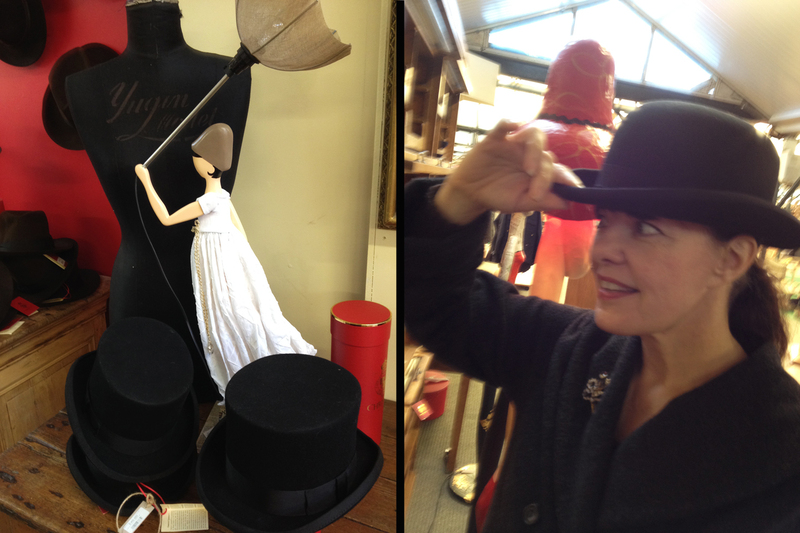 I discovered your blog through Carolyne Roehm last Sunday, and have read all of your posts during the course of this week. What a pleasure it has been for me to get to know you as a mother, artist, and overall inspiration to others! When I discovered that you are a collector of china, especially tea sets, and hosted tea parties on a regular basis (Tea Cup Tuesday), I knew that we were kindred spirits! My mother, (who passed away in 2006 at the young age of 58) used to hold tea parties for my children, nieces, nephew, and younger cousins because she wanted to make sure that they had the experience of having proper tea. Being from the American South, tea was usually served cold, or held at ladies church meetings, sorority meetings, bridge club, or ladies luncheons. My mother brought the practice of high tea into our home. We always drank tea in my house, never coffee. I didn’t drink coffee until I met my husband George, who is a pianist and an elementary school music teacher. However, I still carry on the tradition and will have a celebratory tea on Friday, to remember my mother on her 66th birthday. I’m not sure when you are leaving to return to Vancouver, but I invite you to have a cup of tea with me wherever you are in celebration of a woman that I feel you would have loved if you had ever had the chance to meet! Her name was Gladys Samuel, and she was a wonderful mother, gardener, artist, great cook, teacher, edifier, and the ultimate re-purposer! 🙂 So many things that I am she was, and It’s wonderful to find people that value the same things! Your collection of books is impressive alone. I loved the book that your friend gave you by Richard Wright with those poignant pictures of the African- American experience. You wrote that you felt you didn’t deserve to have such a treasure, but you do! As an artist and a lover of the human race and all that is fair for everyone, you deserve to have a treasure because you appreciate it! As an African- American woman, I am proud that the book landed in your hands! Thank you for sharing your feelings and the book with all that read your blog. Maybe someone’s perception will be altered for the good of all mankind. Your Rev. Dr. Martin Luther King post was appreciated just as much! You are amazing! Thank you so much for having the heart that you do! Your artwork is absolutely incredible! I would love to have one of your vintage music sheet drawings to hang over the piano, because I find them breathtaking! I am willing to purchase, so please contact me at your convenience. Thank you for allowing me the chance to get to know you, and sharing yourself with the world! Blessings to you, your work, your travels, and especially your loves! Oh my gosh Anna, I feel absolutely humbled, touched and a little teary. 🙂 Thank you so much for your incredible message to me. I do feel very honoured to own that book and it is on prominent display in my library where my children are free to browse thru it and share it. I would like to wish you a wonderful and memorable celebration of your late mother’s birthday. Tea is so lovely and such a wonderful, calm way to celebrate and remember. I’d love to get to know you better. Are you on any social networks? Please let me know. Much love and gratitude from me to you. You are quite welcome, and I mean every word! How wonderful it is to hear from you! I really am looking forward to Friday celebrating my mother during tea. We(my husband, daughter, & son) reminisce about past events, and celebrate the life she led. Thank you so much for your well wishes! I am on Facebook, but I must admit that I hardly post anything. I do log on from time to time. Believe it or not, I’m quite old fashioned and still enjoy receiving letters in the post! You can contact me via email( I believe my address appears on this site) and we can begin from there. I look forward to hearing from you. Please let me know if you cannot obtain my address from this site. Take care! You are making me so wistful for spring! 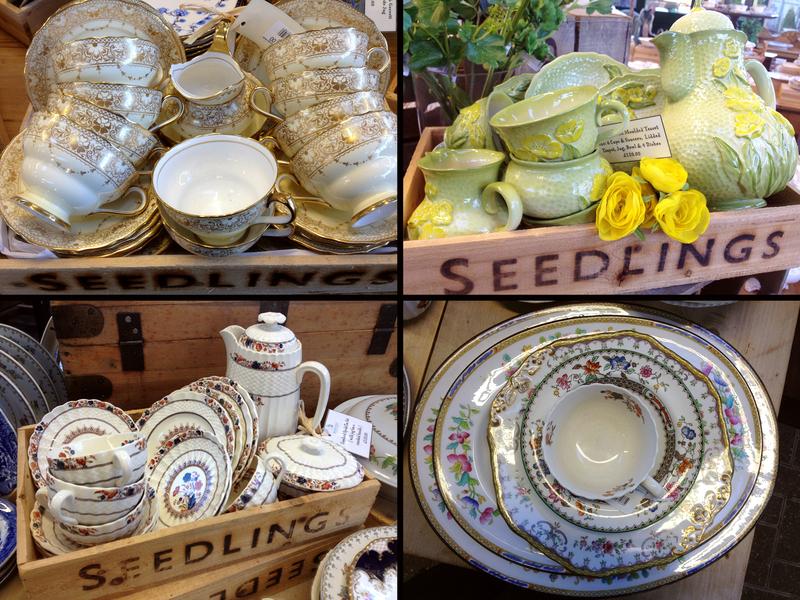 I want flea markets and open houses at the garden centers and the smell of fresh dirt! Hope your journey back to Canada will go smoothly – and so sorry that the weather here as been mostly awful!! Hi Joanne. thank you so much. Jet-lag has been an UGH so far, but it’ll go away soon. Oh well, the weather is about the same here in Van, except I’m on a granite rock pile so not such flooding. Boy was I upset I couldn’t get into Oxford! Oh well, back in the summer and I’ll ask R for a drive over your way. 🙂 Oh, are you planning on Art in Action at all? I know Jackie Morris and Hanna Willow and those guys, (https://www.facebook.com/TheSisterhoodofRuralists) usually come. The black bowler hat is adorable! Wear it!! Being A tea -cup and saucer lover, I pretty frequently visit your site and return feeling inspired. You, your artworks , your collections are amazing ! Hello my new friend! I love your name and am so glad to meet you. 🙂 Also, so glad you left your addy because now I can come get to know you. Off to have a visit.